In April 2016, Ton Duc Thang University participated in the International Cultural Festival organized by IRO, UMY. Recently, 19 UMY students were sent to Vietnam in July 2017 to participate in the same program, the International Cultural Festival. They were sent under the English program with two lecturer which is Mrs. Evi Puspitasari, S,Pd. and Mrs. Sri, Sudarsih M, In.T. The event takes place from 3-8 July 2017 at Ton Duc Thang University, Ho Chi Minh City, Vietnam. The ICF held by TDTU comprises 4 participating countries; Vietnam, Thailand, Cambodia, and last but not least Indonesia. 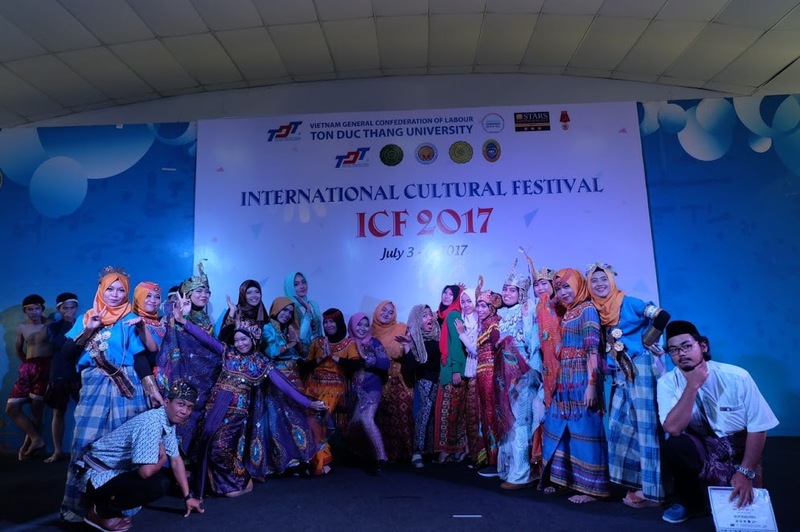 There a lot of activities provided by the ICF for student participation as example food festival, campus tour, folk games, inter-country performance, Vietnamese language classes, and city tour. The purpose of this event is to strengthen the relationship between ASEAN countries and to introduce intercultural traditions and cultures as well. Lutfhiana Umahati as a representative of PBI students participating in the activity said “we have had a lot of experience in culture in this activity. Besides we can learn the culture of other countries, we can also show that Indonesia has a variety of languages, dance, food, custom clothing, and regional and national songs “. In addition, Lutfhiana who also had the opportunity to sing two national songs also said that she was proud to be able to bring Indonesian patriotic songs which is Tanah Air Beta and Tanah Airku in front of hundreds of interfaith representatives. Finally, Sri Sudarsih as Kaprodi PBI hopes that there will be continuation of cooperation between partner university both in academic field including student exchange, school internship practice and educational institution, international KKN, visiting scholars and joint seminar, also art and culture cooperation involving students from participating Universities.